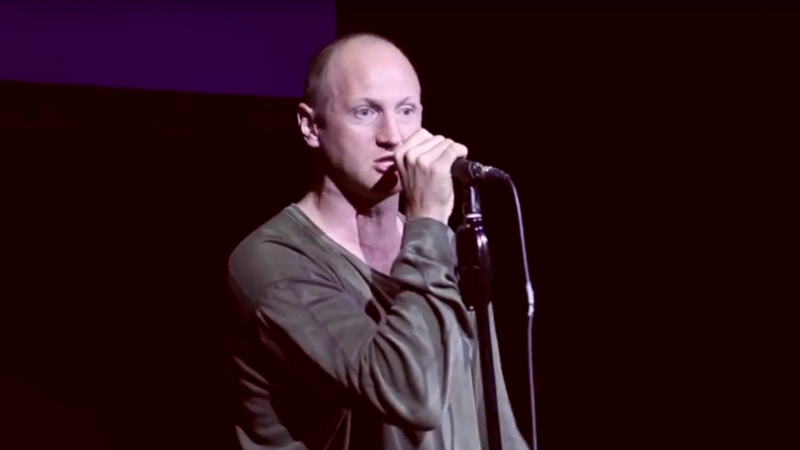 The first thing I noticed about Baba Brinkman, a Canadian rapper and playwright, was that he didn't seem to be taking himself too seriously, which I thought to be a critical characteristic for the performer of a solo show that spends over an hour rhyming on the theme of climate change in an indie playhouse. The second thing I noticed was that, despite all appearances—and the fact that the promotional poster for the show said 'Mo' carbon, mo' problems'—Brinkman was pretty good at plying his trade. As I entered the SoHo Playhouse in Greenwich Village I realized I'd been there before to see an off-Broadway performance. I also felt the same sensation that I could be on the set of a Tim Burton movie. The place just does such a good job of impersonating the recessed, narrow theater that it is that it feels like it could all be a set. However, the actual stage looked remarkably different. No longer set up like the living area of a modern condo, it resembled the stage of a comedy club. A stool and a mic awaited orders. But the topic was nothing to be laughed at. As I mentally steeled myself for what was being promoted as an 80-minute "Rap Guide to Climate Chaos," a tall, balding, white man in his mid-30s walked across the stage and took a seat on the two stairs separating it from the audience. And then he started rapping. As Brinkman flowed through the first few tracks—a surprisingly detailed history of climate science dating back to the early 1800s and a personal history from his time growing up in rural Canada with a mother who wrote her thesis on climate change—I took note of a few more qualities of the performer that I judged to be solid attributes. Brinkman wasn't hypocritical and he wasn't preachy: two of the most salient and pervasive qualities of people trying to spread the good word on climate action. Interspersed between tracks like "Laudato Si" (about Pope Francis’ environmental teachings) and "Make it Hot" (about carbon pricing), Brinkman also found space to reflect on his own jet-setting lifestyle, saying that while he believes the climate diagnosis is dire he's not willing to give up his livelihood. Not many people are. Brinkman made clear that he values policy prescriptions over individual actions, which helps explain his decision to fly to the Paris climate conference last December and rap for what must have been the most captive audience imaginable: a group of policymakers passionate about climate change and stuck in a vast conference center for over a week. One minor quibble I had with the performance was that Brinkman does a very convincing number impersonating a climate change naysayer who thinks strong action on climate is both unnecessary and unhelpful, but then fails to follow up with a full takedown of the argument. It was a little confusing and I felt it interrupted the otherwise cohesive messaging. It seemed like something he could iron out before recording the final version of the album. Brinkman has released a number of educational hip-hop albums on a range of topics, including human nature, wilderness, and evolution. For this latest climate manifestation, he raised nearly $15,000 through an IndieGogo campaign. Up next: artificial intelligence. The Wednesday night crowd only numbered close to 20, but Brinkman managed to keep everyone engaged throughout. I'm pretty sure he made eye contact with me at least a handful of times. The performance only lagged briefly when it seemed to get a bit repetitive, but once we got to the freestyle section in which the audience suggested topics he'd missed it was an exhilarating sprint to the end. I suggested media coverage, which he somehow managed to mesh with fuel cells in what appeared to be a successful transition. I left the theater feeling more hopeful about humanity than I had the last time I'd been there, when a cheeky indie performance felt flat and uninspired. If nothing else Baba Brinkman is inspired, and preachers of climate action or deniers of climate change could benefit from an hour of his time, and his rhyme.